hello guys i have HP z220 Workstation ! but after that i see that i still dont hear sound ... and also after i plag microphone or headphone i dont see that and also i dont see new device plagged in jack port notification . -in computer startup after i push on button i hear bad sound from speacker for 0.5 sec ..
is that mean my on board sound card dead ? how to fix it ? how to find in in motherboard ? 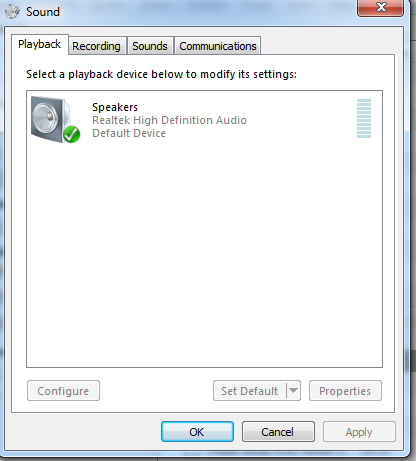 You should be able to just select the Realtek device for audio output and set it as default device. If that doesn't work, uninstall the video card driver and don't install the other options but just the video card driver. Go to the start orb and in search type in device manager. Do you see any yellow exclamation marks? Under your sound playback properties. 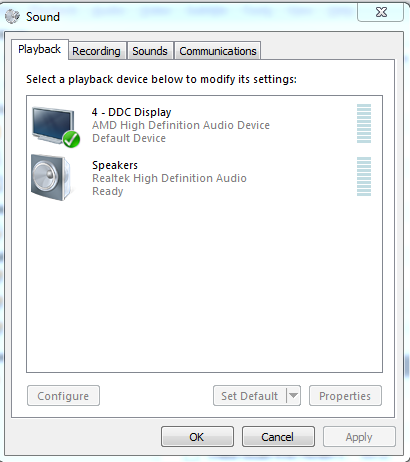 Is the Realtek device set as default? In my experience with graphics cards, nVidia cards have a one cable HDMI Video and Audio whereas with the AMD range you need to connect a separate audio cable between the back of the graphics card and the HDMI display or a speaker setup. Does the Speakers connected to the computer have own volume control? You might have accidentally adjusted volume output, while playing with HDMI leads. Check the volume level here makes sound audible. If you click the icon and then click properties or configure what do you get? no sound after upgrade to win 7 = ?